There is a very slight risk of tornadoes but the threat is low. ATLANTA -- Monday could bring severe weather to metro Atlanta and West Georgia. The National Weather Service has indicated both moderate and slight risks. This is all the result of a cold front. There is an 80% chance for the rain and highs will be in the upper 60s. 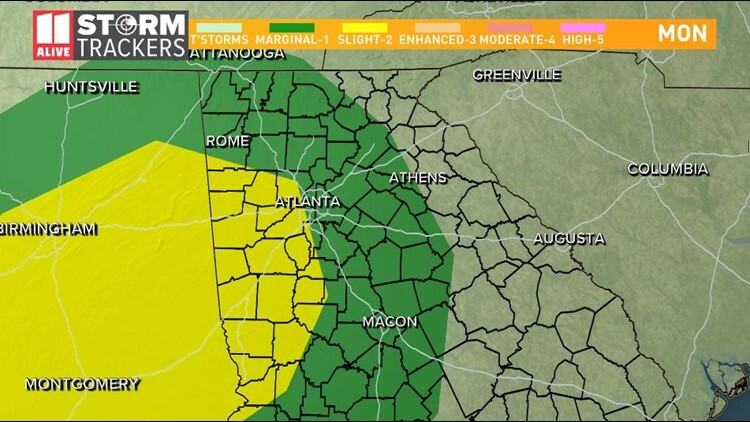 Counties west of Atlanta, including western Cobb, Paulding, south Fulton, Douglas, Coweta, Fayette, Carol, Heard, Spaulding, Clayton, Troup and Merriweather counties are under a slight risk. There is a marginal risk from counties between Atlanta and Athens. Here is a timeline of when to expect rain and the possible severe weather. Scattered showers could develop between mid morning and about 3:00 p.m. in the outlined areas. Between about 4 – 9:00 p.m. is when scattered thunderstorms are expected to begin. Some of those storms could be strong to severe. There is a very low tornado threat, but it cannot be ruled out altogether. However, it is low. The main threat with the thunderstorms will be damaging winds and large hail. The morning commute is expected to be clear for most of the area. There is a slight chance of showers in the afternoon on Tuesday.